Tula ammunition derives its name from its birthplace - Tula Cartridge Works in Tula, Russia. Founded in 1880, the Tula Cartridge plant is one of the largest manufacturers in the world. The Tula brand has developed a worldwide fanbase due to their price friendly yet rugged products. They're cheap but they still go bang! 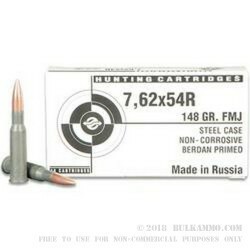 Featuring a polymer-coated steel casing and non-corrosive Berdan primer, these bi-metal jacketed rounds are filled with a lead core which results in fantastic, accurate shots. This rugged ammunition is made to perform in a rugged country withstanding temperature differences from -58 degrees Fahrenheit to 122 degrees Fahrenheit- so you know it’ll work here! 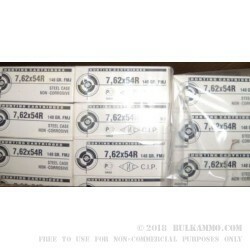 These 7.62x54 148gr FMJ rounds are used for hunting and sporting and great food for your carbines, bolt-action and semi-auto rifles. This round is one of the oldest cartridges still in regular combat service with several major armed forces in the world. In 2011, it reached 120 years in service. This ammo is newly manufactured, economical, reliable and produced by one of the most established ammo plants in the business. Get your today!